To desalt the cod, wash the fillets well to eliminate the salt on the surface. Place in a container and cover them with water, let sit all night or at least 2 hours before consuming. You should change the water out a few times (2 or 3) to remove the salt quicker. In the meantime, cook the potatoes in water with salt and cut the rest of the ingredients, so they're ready. Once the cod is desalted, crumble it. Mix all the ingredients for the salad or layer them in a tray. First the cooked potatoes, then tomatoes, eggs and the cod. Pour the oil on the salad. You can add avocado, lettuce, olives or vegetables. You can boil the cod after it's desalted if you like. 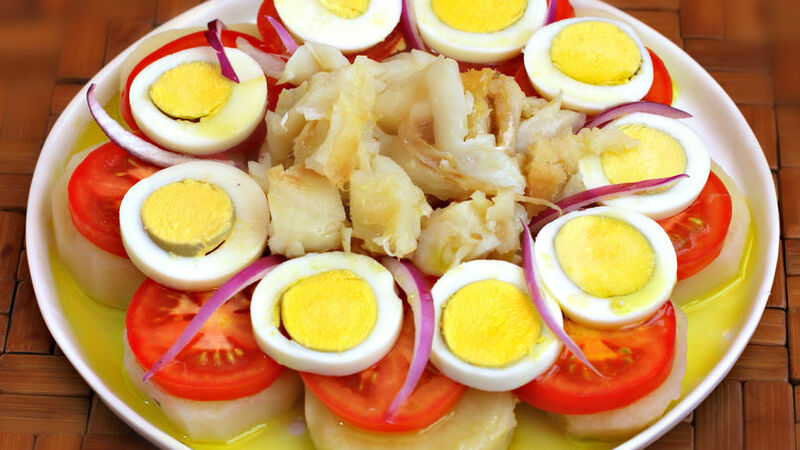 Seranata de Bacalao is a beloved dish in Puerto Rican homes and though it can be enjoyed year round, it becomes even more popular during Lent, along with fish escabeche or cod fish with stewed eggplants.